I should have taken a photo of this bed a couple of days ago before I trimmed up the vine on the left hand side, closest to the beans. It’s already impossible to walk between the bed and the eggplants on the right, but I really didn’t want to have both sides overtaken. 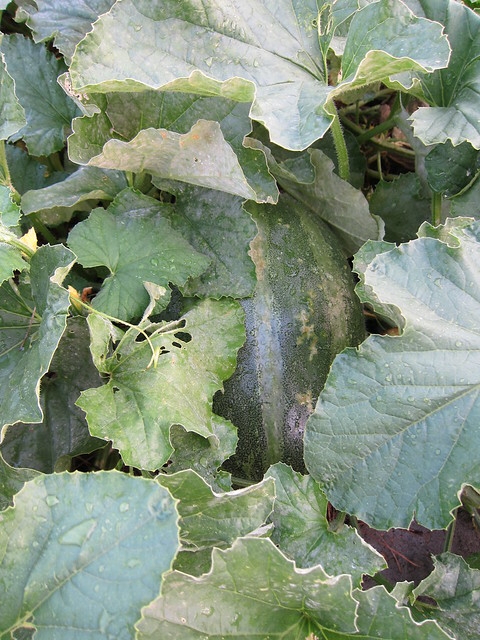 The melon in this bed is the Bidwell Casaba melon—and apparently tastes like orange sherbet. Two weeks ago we had several afternoons of thunderstorms which provided a much needed drenching for the beds. In turn the beds responded by exploding in new growth. This one has just kept on going. 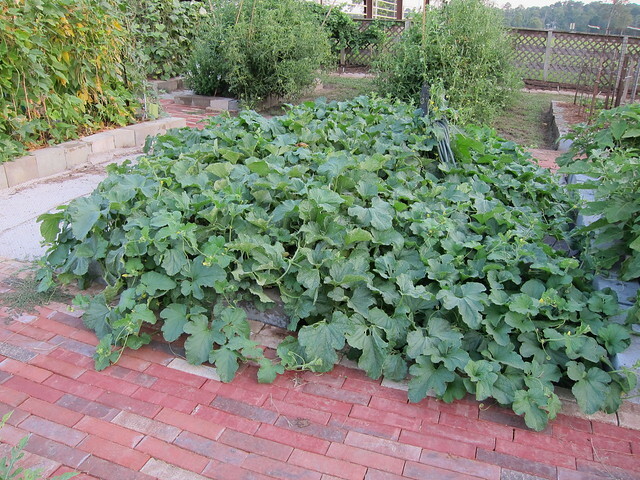 The vines of the melon aren’t the only things out of control, the size and speed of growth of the fruit is incredible. I think it was last Saturday that I went out and this same fruit was only a couple of inches long. 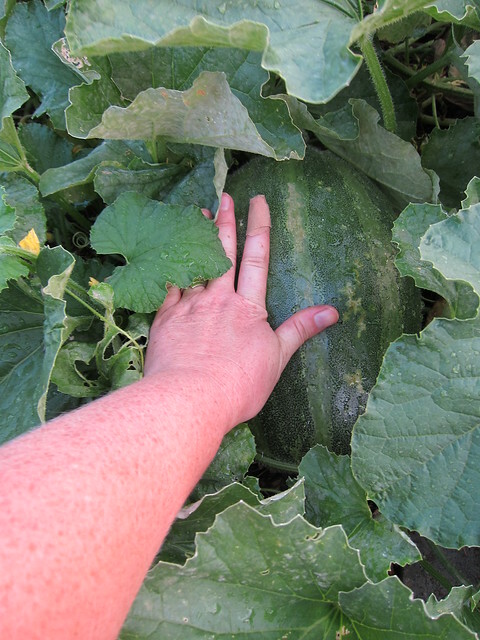 When I went on Monday the melon was just a bit smaller than this! 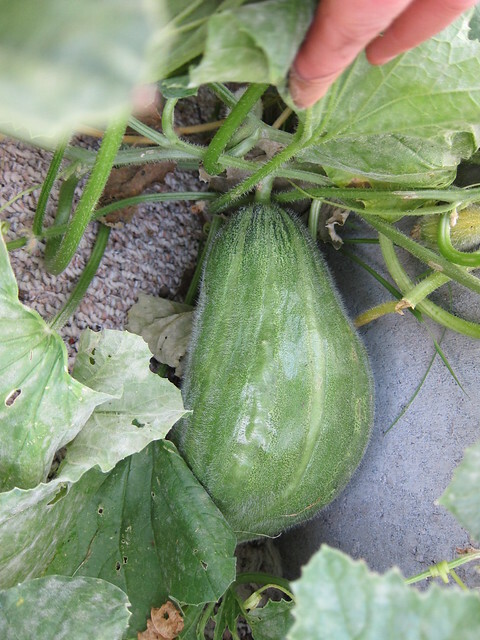 I’ll be happy with melons right now as they are the only things handling this heat (and the peppers)—though I’m still surprised how my tomatoes are trucking along despite my complete apathy towards them. I’ve picked one too many tomatoes this season (though I really do appreciate them!) and the Sungolds have almost worn out their welcome. Perhaps if I hadn’t been fending off leaf footed bugs for so long.